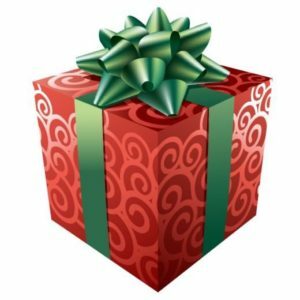 Getting gifts for those with mobility challenges can be, well, a challenge. People who have limited hand functionality, or use a wheelchair make traditional gifts completely impractical. Here are some suggestions for gifts that will not only delight but may even make someone’s day a little easier. Back in February of this year, Tommy Hilfiger launched the first-ever adaptive designer clothing line for children with disabilities. The 22-piece children’s offering is comprised of items that look just like clothing in the company’s regular collections, but include magnets, velcro and other modifications to allow for easy on and off for kids with disabilities. Clothing & Jewelery – 3ELove‘s company’s trademarked International Symbol of Acceptance (wheelchair heart logo) is the drive behind it’s social mission to provide the tools for others to embrace diversity, educate society, and empower each other to love life. What was once just a small Chicago disability pride clothing brand is now an international movement of acceptance. 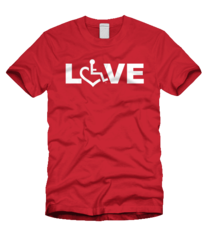 People with disabilities are everywhere, and thousands of t-shirts and other items later, so is the 3E Love message. Liftware is a stabilizing handle and a selection of attachments designed to help people with hand tremor eat more easily. It automatically stabilizes so the attached utensil shakes 70% less than your hand. Liftware works best with mild to moderate tremor. 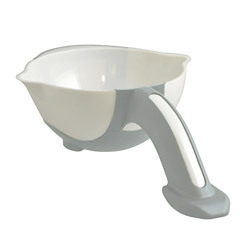 Stay Bowl with handle and non-skid base helps people who have difficulty eating due to lack of upper body and/or extremity control. Vitaglide – The Vitaglide Wheelchair Exercise Machine is a revolutionary exercise system for athletes of all fitness levels who are in wheelchairs. The VitaGlide exercise machine has been designed to increase range of motion and exercise more muscle groups, resulting in a more efficient and effective workout than with traditional arm crank machines. The VitaGlide also helps to rehabilitate shoulder pain and protect the shoulder against possible injury. Active Hands – Active Hands make gripping aids that gently, yet firmly hold your hand into a gripping shape enabling you to hold tightly onto objects from hammers to garden tools; gym equipment to wii controllers; ski-outriggers to boat tillers; adaptive bike handles to musical instruments; and many more. Their gripping aids are designed so that the user can put them on independently. They are ideal for tetraplegic/quadriplegics, those with Cerebral Palsy, stroke recovery or any disability that affects hand function. Available in a range of sizes, our aids suit from small children to large-handed adults! Enabling Technologies was created in 1985 by T.G. “Woody” Witte who saw a need for improved equipment for the disabled athlete. 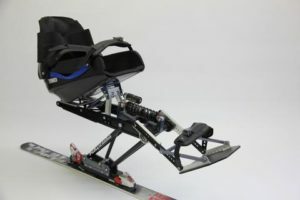 From the original Unique 1 monoski, to Superlite outriggers and crutches, and the versatile biski, Enabling Technology has been a leader in improving the quality, safety, and performance of adaptive equipment. They have also been an active force in the ongoing creation of standards and practices of adaptive sports worldwide. Be warned, they aren’t cheap!! Wheelchair Accessories – Diestco Manufacturing Corporation has been manufacturing for 21 years. 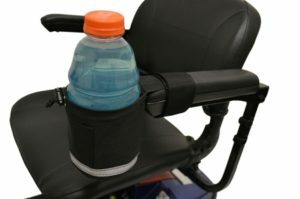 They have learned that new product ideas come from you, the customers.From cell phone holders to walker bags and powerchair covers, they’ve got your wheelchair accessory.